Steven Pasquale also stars in Christopher Demos-Brown's new production. 'American Son' runs through Jan. 27 at the Booth Theatre. 222 W. 45th St., americansonplay.com. While opinions about Christopher Demos-Brown’s tight, topical and highly provocative race relations drama “American Son” will probably differ wildly, it deserves much credit for addressing difficult but important societal concerns with thoughtfulness and empathy — and for being able to rouse such intense reactions. 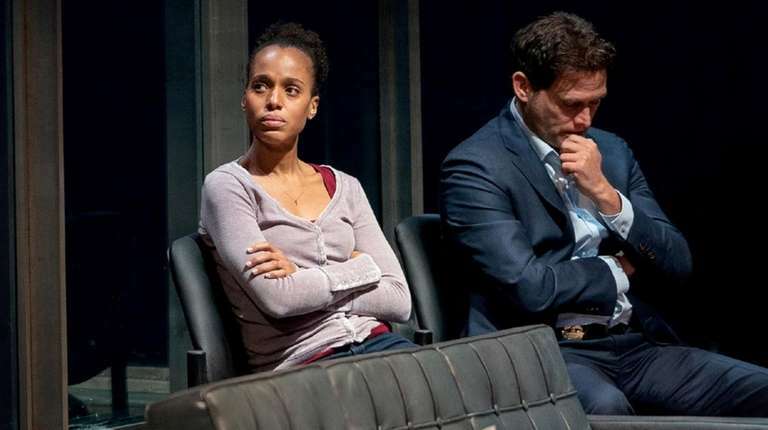 The 90-minute play comes to Broadway following several regional productions, with direction by Tony-winner Kenny Leon (“A Raisin in the Sun”) and a solid four-member cast led by Kerry Washington, who last appeared on Broadway nearly a decade ago in David Mamet’s “Race,” and Steven Pasquale (“The Bridges of Madison County,” “Junk”). You probably haven't heard of Demos-Brown, who works by day as a trial attorney in Miami. Set late at night at a police station waiting room, Kendra (Washington, shaken and vulnerable), a black psychology professor, and her estranged husband Scott (Steven Pasquale, cool and crisp), an FBI officer, are searching for their 18-year-old son Jamal, who did not come home that night. A young on-duty officer (Jeremy Jordan, well-meaning and clean-cut), following protocol, will only provide limited information — namely that Jamal’s car was stopped by the police and an investigation is underway — until a public affairs liaison (Eugene Lee, world-weary and combative) arrives. As revelations are slowly uncovered, the characters confront issues of racism, mistrust of the police and raising African-American children, revealing profound differences in how the characters view the world. At one point, Scott accuses Kendra of instilling “victimhood psychobabble” into Jamal. At its best, “American Son” is smart, mysterious and engrossing — not to mention an effective star vehicle for Washington, who gives a revealing, sympathetic performance in which her character’s professional veneer gives way to surmounting doubt and desperation. That being said, it can also feel thin in premise, didactic in tone and one-dimensional in characterization. In any event, it will instigate a debate among its attendees that may prove to be even more meaningful than the show itself.